This ain’t gonna be no long-winded epistle, brothers and sisters. With bellies full of ham, turkey, goose, and Christmas cheer (did you know it comes in a Rebel Yell bottle?) who is in the mood for that? This here blog entry is my little Christmas card to y’all, nothing more; a brief outline of another Chaos Manor South Christmas combined with a little sentimental reminiscing. Oh, of course, I’m gonna tell y’all WHAT I GOT! As I type, it’s Christmas Eve at Chaos Manor South. Darkness and quiet has descended upon the Old Manse. Along with torrential rain. Meaning the scopes are nestled all snug in their beds. For the 4th year in the row our traditional Christmas Eve look at M42 and the glories of the sword has been skunked. Ah, well. There’s always next year. Otherwise it continues to be a glorious season, and your ol’ Unk is content to sit back tonight with a dollop of Yell and reminisce about holidays of yore—the glow brought on by lots of Italian restaurant food and wine from Miss Beth’s birthday fete (she is home from Yankeeland for the week) only enhances Your Old Uncle Rod’s naturally mellow mood. Cue the soundtrack from A Charlie Brown Christmas. Reminiscences ? Christmas reminiscences? Strangely, equipment hound though your Ol’ Unk is reputed to be, most of my Christmas astro-memories have nothing at all to do with what I got any particular year. My big amateur astronomy purchases are almost always done in the spring or fall in preparation for the coming observing season. You still wanna play “wutyouget,” even if Unk don’t have a brand-spanking new umpty-inch compu-CAT to boast about? Well, as usual, Miss Dorothy laid a passel of astro-accessories and books at the foot of the tree. Let’s start with a book. Astronomy books are popular for Christmas down here in The Swamp—the clear skies of November inevitably give way to storms long before the 25th of December. As y’all may know, Unk is a longtime and still-enthusiastic double star maven , and is proud to contribute a little of his middling expertise in the field to our homegrown pub (University of South Alabama), The Journal of Double Star Observatons. So, I was delighted, once the rest of the family finished their frenzied wrapping paper ripping, to find a copy of Bob Argyle’s Observing and Measuring Visual Double Stars lodged up against the tree-trunk. While this book is slanted toward those of us who’ve become right serious about these delightful luminaries, there is somethin’ here for everybody, and there is even a cool accompanying CD containing the Washington Double Star Catalog and other Cool Stuff. What else? As y’all have no doubt heard tell, Mr. SCT has been spending an increasing amount of time observing with a 12.5-inch Dobsonian. Why? It’s nice to take a break from the tech once in a while, and I must admit the deep sky puts on quite a show at f/4.8 with the help of a dadgummed Ethos or two. My time-honored Dob, Old Betsy, recently underwent a considerable refit, with me adding (with the help of ATM extraordinaire, Pat Rochford) Sky Commander DSCs, a smaller secondary, a new secondary holder and secondary heater, and improved side bearings. I also upgraded the primary with Spectrum’s super-duper “Max-R” coatings. I am not exaggerating when I say the ol’ warhorse is performing like a brand new scope. Despite all these fixes, though, at October’s Chiefland Star Party it became abundantly clear there was still something Betsy lacked. We got our share of rain at the CSP (as well as some beautiful skies), and it was soon obvious I needed a better scope cover than the Mylar Desert Storm one I’d been using for nigh on 10 years. This cover works great with my kitty-CATs. But it ain’t worth a hoot with a Dob. It will, you see, not fit over the rocker box when the tube is pointed much lower than vertical. And that is no good a-tall. For safety’s sake, a Dobsonian needs to be tilted over toward the horizontal so it will be free to “weathervane”—rotate freely in azimuth when a wind blows up. Leave one standing straight up, and an errant gust is likely to tip the whole derned scope over. What I resorted to Down Chiefland Way was covering the forward part of the scope, the truss and upper cage, with the Desert Storm cover, wrapping a tarp from the Chiefland Wally World around the rocker box, and securing that with bungie cords. Needless to say, that was a pain in the rear at 4am, and not as secure or waterproof as I’d a-liked. What to do? I noticed one of the Dobsonians set up nearby was sporting a right nice cover. One that was shaped so as to slide over the truss and upper cage, over the rocker box, and be fastened with a drawstring under the ground board with the scope near-horizontal. Now yer talking! Closer examination revealed that it was made of what appeared to be waterproofed fabric, Nylon, looked like. Who made the thing? I spied a nice embroidered AstroSystems logo on the upper end. When I got home, a visit to the AstroSystems website filled-in the details: their cover is indeed Nylon, but with a Polyurethane inner lining and an outside sprayed with water-repellent stuff. 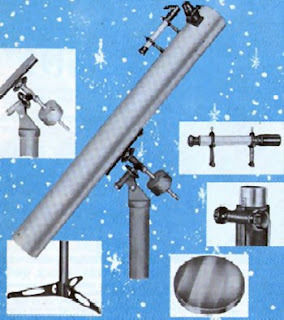 A little more browsing of the webpage and a little wheedling with Miss D.: “Guess what you can get me for Christmas, Honey” and an AstroSystems scope cover was on its way. I was amazed that, at this time of the year, Randy Cunningham and Co. still managed to get me my cover in a little over a week. Naturally, I had to give the thing a good check-out (indoors) before handing it over to Dorothy for wrapping. I was even more impressed than I had been at CSP. In addition to the very well made and generously sized cover (I ordered the 14.5-inch model in order to accommodate my many finders, Telrads, etc. ), a secondary cover was included in the package (I will probably continue to use Crown Royal bags ‘cause that gives me an excuse to drink the stuff every once in a while) as was a strap for fastening a weight to the upper cage for added stability in windy conditions. Finally, there was a nice fabric bag to hold the whole shebang. I hope to try ‘er out for real in a few weeks and will let y’all know how it works out, but it looks to me like my Dob cover problems are finally over. You may not believe it, but after all these years I still do not have a motorized focus for my main C8, Celeste. Make that did not. A good cover for Old Betsy was one of the few things in the “put off buyin’” category I could think of, and a C8 focus motor was anudder. Sure, I’ve got used to focusing manually over the years, and know how to exercise a light touch, but I’ll admit I’ve had more than one image ruined by my “good enough” focusing. It’s hard to get things just right when every adjustment brings on The Shakes. I’d also noticed that Shoestring Astronomy has begun selling a little electronic box (for a pittance) that will allow you to interface your motor focus to yer PC and really make focus-tweakin’ easy. Hell, I’d be able to focus the damned U8 without getting up from my seat at the computer. That’s exactly the kind of thing that appeals to this ol’ Lazybones. Who makes motorized focusers for SCTs these days? I’m sure a number of outfits do, but, as always when thinking about gadgets like this, one name entered my mind: Jim’s Mobile. I’ve been buying stuff from JMI for at least twenty years, and it just seemed natural to order their famous C8 Motofocus. It arrived promptly, and, like the Motodec unit I’ve been using for a decade and a half, is well made, easy to install, and included a nice hand control. Hell, Jim even puts batteries in the little HC for ya. I think I am gonna like the modern way of focusing, and will report back as soon as I can get a CAT out onto my club field. But all the above good stuff was this year. What about them Christmas astro-memories I was going on about earlier? Well, like I said, it’s the skies not the stuff that seems to stick in my mind. Like the times I’ve stood out under a pitch black sky (well, kinda, we are talking about Chaos Manor South’s backyard) under the glittering diamond-hard stars of winter and drank-in the majesty of the celestial hunter. Our Christmas Eve look at M42 is a tradition I started soon after Miss D. and I married 15 years ago (seems just like yesterday). We don’t haul out a big gun; maybe just a Short Tube 80 or the StarBlast, and we spend about as much time looking at The Sword with our unaided eyes as we do with the scope. Naw, it don’t look like it does in Bubba’s 25-incher from the pitch-black skies of Houndog Holler, but that don’t matter. We admire it still, sip a little eggnog, reminisce about our wonderful past Christmases together, and before we know it, Christmas Eve has ended and another Christmas has begun. You know what campers? I think I got everything I wanted this time. Well, almost; I didn’t get that world peace I ask for each and every 25th. I did get another wonderful year in this wonderful avocation, another year with my wonderful wife, and another year of wonderful friends like each and every one of y’all. Merry Christmas and a Happy New Year (as well as a Happy Hanukkah, a Glorious Eid al-Adha, a beautiful Winter Solstice, or whatever floats your boat). I think it is gonna be a good year, no matter what the consarned Dow Jones does. See y’all again on the cotton-pickin’ first of January! I’ve told the story of my first look through a telescope and my own first telescope often enough, I reckon. That’s natural; that’s what sticks in our minds even as we get years and years on down the amateur astronomy road. Can I tell you about my second scope, though, muchachos? It’s the one that really mattered, that had the most to do with setting me on the strait and narrow to a lifetime of enjoyment and wonder. I’m not the only one who’s loved and fondly remembers The Pal, either; this little classic of a scope, Edmund Scientific’s 4.25-inch f/10 “Palomar Junior” Newtonian, was how many, many space-crazy younguns got their start in the amateur astronomy of the 1950s and 1960s. Before there was a Pal Junior, though, there was the Tasco 3-inch, the coming of which I’ve documented in some detail in Stephanie’s Telescope. I was the greenest of green novices at the time, sure, but it wasn’t long before even I realized that something wasn’t quite right with my Japanese wonder-scope. 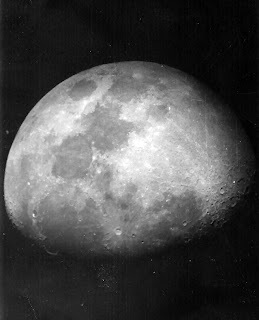 The Moon looked pretty good, good enough that I attempted some afocal pictures of her with my box camera. Stars and those deep sky objects I could see didn’t look half bad neither. Oh, the stars were a little spikier and weirder-looking than I’d expected, but I put that down to my own inexperience. What tipped me off somethin’ warn’t quite right was the planets. As wet behind the ears as I was, I was still able to locate what I supposed must be Jupiter and Saturn and Venus. What did I see? No belts. No rings. No phases. What I saw was, as I’ve said more’n once, something that looked more like a custard pie than a planet. At first I supposed this must be my fault. I knew about collimation, and had attempted that fine and arcane art. I must have messed it up somehow. I spent hours tweaking, getting the Tasco just right—which wasn’t really that hard. It had an OK primary cell and a surprisingly good secondary mount and spider. No dice. Custard pie still. I’ve often wondered about that little feller over the years. Was his primary really bad, or was it somethin’ else? Maybe the little mirror was held too tightly in its cell by the clips? I hadn’t known enough way back when to check that. In recent years, however, I’ve decided that, no, it was just a punk little scope. My Tasco Newt is long gone, and I’ve never run across that particular model again, but it is very similar to its contemporaries sold under the moniker “Adams Celestial,” and I have seen some o’ them over the years and verified that their optics ain’t nothing to write home about either. So where did that leave little Rod? Not overly happy, but happy enough. I still longed for belts and rings, but the scope did, as above, do a good job on the deep sky within the limitations of its tiny aperture, so I concentrated on that—not a bad thing, I reckon. No denying, though, that I was, like every amateur then or now, soon lusting after More Better Gooder. Me ol’ Mum, a school librarian, had the kindness and foresight to order me a subscription to that little ol’ rag from Cambridge M.A., Sky and Telescope, and that in short order edumacated me that my options extended way beyond Tasco and Gilbert. Soon, the folks’ mailbox was bursting with a brace of scope catalogs: Cave, Starliner, Optical Craftsmen, Criterion, Unitron, and, most of all, Edmund Scientific. In this latter day, you newbies cain’t imagine what a huge presence Edmund Scientific was in amateur astronomy in the 50s, 60s, and even into the 70s. Today, telescopes are a sideline for both the original Edmund, which concentrates on sales to universities and industry, and the bought-out “consumer division,” which mainly peddles science-oriented gimcracks. Back in the 60s, though, for many of us, Edmund was amateur astronomy. Like me, most of us amateurs, even those out of short pants, couldn’t afford the beautiful 4-inch Unitron Photo Equatorial or them hulking Cave Newtonians. We could, however, dream of Edmund Scientific’s mighty SPACE CONQUERORS. These lovely white-finished scopes, which included a 4.25-inch, a 6-inch, and an amazing looking 8-inch were still dreams for most of us, mind you, but they were at least dreams with a tangible thread of hope runnin’ through ‘em. Soon, Edmund’s little (but thick) digest-sized catalog was my study-hall and lunchtime reading matter of choice. Yeah, it was filled with gadgets and gimcracks aplenty, like today’s Edmund. But there was some amazing stuff even amongst the foolishness. In those less uptight days, you could, for example, order a little envelope full of Trinitite, the baked glass sand resulting from ol’ Oppie’s big party at Los Alamos back in ’45. Most of all, though, there was an astronomy section, a big one. Not only were there those lovely scopes, there were eyepieces, books, and accessories aplenty. Sam Brown’s wonderful illos figured prominently. The little book just reeked amateur astronomy. Hell, I probably wore out three copies (Edmund kept sending new ones without complaint). Drool-soaked pages don’t last long, you see. I liked looking at the accessories, of course, but what I stared at the hardest over the summer of ’65 was The Super Space Conqueror. This majestic instrument was not just imposing-looking; a scan of the catalog blurb revealed it was a powerful performer, “Clearly shows you the Rings of Saturn, Jupiter’s Moons, Mars, the Craters of the Moon, and all the wonders of the sky.” Haysoos Christmas, this thing would even reveal stars, the catalog said, down to 13th magnitude. And it was equipped with a real equatorial mount, a finder scope, and—get this—a clock drive! Hotcha! I was in. Who could ask for more? The only trouble was how to get one. Prominent in the advertisement were the numbers $199.50. Which was a lot. Equivalent to about 1000 bucks in today’s dwarf currency. Big Trouble in River City for li’l Rod. A quick back-of-the-envelope calculation revealed I might be able to amass such a sum (mowing lawns, birthday and Christmas cash, collecting soda pop bottles) by the time I graduated high school. How about Criterion, then? I had also received a catalog from that other giant of 1960s amateur scopedom. Nope. Their highly regarded (including today) RV6 Dynascope was exactly five bucks cheaper than the Edmund SSC. What then? The next step down for both companies, a 4.25-inch Newtonian, might be doable…but…no…NO WAY. A six inch was the instrument for any self-respecting amateur. I knew that. Patrick Moore said so himself. I would not settle for a mere four. Not until fate landed a Palomar Junior in my lap, that is. The funny thing about the little Edmund telescope all of us remember so fondly as the “Palomar Junior” is that the the company didn't call it that very often. In most of the catalogs it was referred to as the “Deluxe Space Conqueror” (as opposed to the SUPER Space Conqueror, natch) or as a “Palomar Type” telescope. “Palomar Junior” was printed on the telescope's little shower-cap type aperture covers in wonderful 1960s script along with an art-decoish star and Saturn. No matter what Edmund called their 4-incher, I’ve never heard anybody who owned one refer to it as anything but "Palomar Junior." Other than a memorable name, though, what did the Pal Junior have to offer, according to the Edmund Bible? I was in favor of the Super, but I’d certainly devoted considerable time to studying the Deluxe’s page as well. Optically, you got an f/10 (or thereabouts) spherical primary mirror. Finder? A 6 x 23mm in dual-ring mounts. The focuser, the Big E said, was a genu-wine rack and pinion. These components were installed in an aluminum tube painted, like all the Edmund Newts, a glowing, holy-looking, white. The Pal's German equatorial mount was similar to that of the Super Space Conqueror but much downsized and no drive was included (though an AC clock was optional). This mount featured setting circles and was perched on a metal pedestal rather than a tripod. Accessories? In a fit of largess, not one but two eyepieces were standard, a 1-inch (25mm) Kellner and a ½-inch (12mm) Ramsden. There was a (gasp) achromatic Barlow, too. The included documentation was extensive and consisted of Sam Brown’s How to Use Your Telescope, The New Handbook of the Heavens, and Edmund’s Star and Satellite Path Finder (a cardboard planisphere). I thought all this was rather ho-hum sounding compared to the Super, but judging by the pictures in their respective catalogs, the Pal Junior was a step or two above the Criterion 4-inch, which was mounted on a rather spindly-looking tripod. The problem remained, however, as to where I’d get 200 bucks for a Super. Till one morning at breakfast my Old Man, AKA “The Chief Op” around our house, let slip that one of his buddies down to The Station (he was a broadcast engineer at a local TV station) had a 6-inch Edmund telescope he might be willin’ to sell cheap. Oh. My. God. I was in an agony of anticipation till the afternoon a few days later when the OM roared into the driveway in his Ford Fairlane and pulled a long cardboard box from the back. Just as I was about to lose it, I noted the look on his face that spelled “Hold on there, little pard.” Turned out the 6-inch Edmund was not a 6-inch Edmund. It was actually the Pal Junior 4-inch instead. Have you ever seen the Warner Brothers Cartoons where Elmer Fudd, in a fit of acute pique or disappointment, shrinks to an inch in height? That was me. Noting my disappointment, the OM gently allowed as how he knew this was not what I wanted, but that he’d told the owner we would give it a try, anyway. After all, he observed, this was something I might be able to afford with some help from him and Mama. I tried to continue to appear dejected, but couldn’t quite keep up the front. There was a telescope in that box. An almost new and nearly unused telescope. As I relate on the Stephanie’s Telescope page, the OM’s co-worker had bought the Pal for his son, despite being well aware that what the boy wanted for his birthday was a go-kart. Mummy stepped-in and demanded a go-kart for her sonny-boy with the result that the Pal had to find a new home. Yep, almost new and looking good once we’d manhandled the GEM outa the VW and mounted the OTA on it. Impressive? Hell, to tell the truth, this was about the size I’d imagined a 6-inch would be. It was, frankly, a fair handful for li’l Rod to lug around, with a tube every bit as long as that of the average 6-incher, and a mount and pedestal that, combined with a big cast iron counterweight, seemed to weigh a ton. Yes, the Pal looked good: ever’thing was there, and there literally wasn’t a mark on him. Then as now, however, only the night sky can pass a verdict on a telescope. There was a nice Moon on the wax on this June evening, and Saturn would even be on display if I could wait till the wee hours. There was no question about that; I was one pumped 12-year-old. First light was more fun than frustrating for once, not that there were not some irritations. Number one was that pedestal. While I thought one would be better than a tripod stability-wise, I had not figgered transporting the thing into my equations. Yep, if I’d had a dollar for every time Mama hollered at me for banging one o’ them damned legs into her furniture, I’d a-had a Unitron Photo Equatorial by Christmas '66. More serious when it came to observing was the fact that the Pal’s OTA was held in its cradle on the GEM by a couple of bolts and wingnuts rather than tube rings. That meant the eyepiece wound up in some uncomfortable positions. While I was vaguely aware that the R.A. axis should be pointed north all the time, I resorted to moving it to point in whichever direction yielded the most convenient eyepiece angle. No, you couldn’t track objects with a single motion with the polar axis pointing away from north, but I don’t think I really knew that was what an equatorial mount was ‘sposed to do for you anyway. Them was minor irritants, though. While the mantra, “just a 4-inch, just a 4-inch” continued to murmur in my head, that stopped abruptly once I got my Pal—I was already beginning to think of it as “my Pal”--centered on a sweet young crescent Moon. Man alive! The craters! I’d thought the Tasco did good, but this was oh-so-much better. Not only was the image brighter at the 90x the Ramsden delivered than it was at considerably lower power in the Tasco, it was noticeably sharper too, with features away from the terminator being much easier to see. It was clear the OM was suitably impressed as well. Early in the evening, I probably also turned the scope to the few DSOs I knew how to find at the time—M13 and M8, likely—and these must have been pretty good as well, but I don’t remember that. I spent most of the night on the Moon. Until Saturn was finally high up enough in the East to fool with. The OM, god love him, hung in there with me. The OM wasn’t ready to talk finance in the middle of the dadgum night, but said we’d talk about it over at breakfast, if I could get up for breakfast, that was. As you can imagine, I had a hard time getting to sleep despite the hour, and paged through The New Handbook of the Heavens under the covers with the aid of my trusty flashlight until at least three. The next morning, true to his word, the OM discussed Ways and Means. Seemed as the telescope’s owner was willing to let it go at considerable discount off the $79.50 in the catalog, but not that much of a discount. The Old Man figured the Pal’s owner would want at least 60 dollars, a still-frightening sum for me. He also said, though, that he’d find a way to pay that off if I’d pay him off by foregoing at least part of my small weekly allowance, kicking-in my lawn-mowing money, and contributing whatever dollars Aunt Lulu and any other relatives sent with birthday and Christmas cards. Also, seeing as my birthday was right around the corner, I would have to agree that the Pal would be my birthday, party and all—though he reckoned Mama would still bake me a cake. Finally, he ruled that we ought to at least try to sell the Tasco (as if I would miss it). “Yes, Daddy, sure will, that’s fine.” We both knew I had a hard time saving money, especially to pay off something I already had in my hands (like the big chemistry set), but somehow we both knew this was different and that there would be no problem. What was my deep sky voyaging like back then? It was somewhat hit and miss. The 23mm finder on the Pal didn’t make starhopping easy, and Norton’s, despite what my buddies in the informal astronomy club we younguns founded that summer had told me, was not that hot either. Oh, it was a beautiful book (if antique-seeming), but even ignorant little me was soon aware that a 6th magnitude atlas just does not have enough “guide stars” to make object-finding easy. Nevertheless, I began to knock ‘em off one by one. Some were sweet--the M42s and M37s. Some were a little disappointing; I was never sure I was really seeing any stars in M13, maybe because I’d been told that required “at least a 6-inch.” And some, like M101, the subject of the previous blog, were impossible. Nevertheless, I kept plugging away, marking ‘em off one by one on a paper scroll-like device I’d “invented.” The OM had given me a discarded roll of teletype paper, and I’d written each Messier’s vital statistics on a section of that paper till I had a long strip listing all 110. Something else the OM had tossed and I’d recovered from the trash without Mama’s knowledge (you will not bring one more piece of junk into my house, young man) was a “calibration guide” for some kind some kind of electronic test gear. Maybe a surplus signal generator. Oh, he was big on war surplus electronics to Mama’s horror, but my delight. This Thing consisted of two mounted rollers with cranks, I wound my Messier scroll onto this and went to town. I’d observe M92 (or whatever), place a check and a short note on the scroll next to its name, and crank on to the next fuzzie. God how I wish I still had this Rube Goldberg Contraption! As most of y’all know, Uncle Rod is a long time astrophotography dabbler. I’ve been trying to take images of the Solar System and the deep sky almost since the first moment I laid hands on the Tasco. I’d gotten some barely recognizable images of the Moon with the 3-inch. That is, you could tell, if’n you held your mouth just right, that they were photos of Earth’s satellite, not a 1960s UFO or one o’ them accursed custard pies--but just barely. I figgered that I might be able to do better with my Pal, which was, after a year or two, now my beloved companion nearly every clear evening. To that end, I decided I needed a better system. With the alt-az Tasco, I’d simply set my little box camera up on a tripod next to the eyepiece, shot afocally, and hoped for the best. The two things I thought could improve my Moon Picture technique were mounting the camera directly on the scope and, well, using a better camera. The mounting problem was solved by a gadget Edmund sold that suspended a camera over the eyepiece via a bracket that mounted into four pre-drilled holes in the OTA (the OK but somewhat rickety focuser didn’t have a lock and couldn’t have supported even the lightest camera). This doo-dad, which sold for $9.95, also included a small screen for Solar projection and, I thought, was therefore a Good Value. As soon as the scope payments ceased, I glommed onto one (Mama was still baffled that I still wouldn’t rather have a slot car). The better camera problem depended on the Old Man. In addition to ham radio, he had an at least off-and-on interest in photography, and had been able to accumulate some fancy (used) cameras over the years, including an Exacta single lens reflex I much admired. Even the least of his stable, a Retina, would have been far better than my plastic 620 film Argus twin lens reflex (which, amazingly, survives to this day). I knew good and well he would not let me borrow one of his cameras—I freely admitted then and admit now that that would have led to inevitable disaster. The secret was to get him interested in taking pictures of the Moon himself. That turned out not to be as hard as I’d expected. I showed him a few of my humble prints made, I confessed, by borrowing his enlarger and print trays when he’d been on transmitter duty at night. Far from being miffed at that, he was intrigued, impressed even, and said he thought he might like to try his hand at the Moon too if I didn’t mind. Mission Accomplished. First thing we discovered was that the heavy Exacta easily overcame the little Pal’s dec lock. In two shakes, however, the OM had cobbled together a tube counterweight out of some surplus aircraft parts he had squirreled away. The pictures he and I obtained were not perfect. The vibration induced by firing the Exacta’s shutter was like the recoil of a .50 cal Ma Deuce. Oh, we tried the “hat trick,” cable releases, and other work-arounds, but with minimal improvement. Still, our results were darned respectable. The one shown here is actually from one of our less successful evenings. The real value of those nights with the OM and his Exacta turned out not to have a damned thing to do with the resulting photos, which were never good enough to grace the pages of Sky and Telescope, even in those simpler times (but which, nevertheless, mightily impressed my teenage amateur contemporaries). No, it was not the pictures, but the memories that developed. In just a few years, as my life began to change in ever accelerating fashion, as teen years melted into young adult years, I began to treasure my recollections of the nights the OM and I spent awash in Luna’s silv’ry glow. I don’t know why I was surprised, but I was, when I became aware the OM did too, at least as much as I did. Till the day he died, way too soon at the end of the 1980s, he’d often mention “Those freezing nights Rod dragged me out to take his Moon Pictures.” The twinkle in his eye showed he wasn’t serious about the dragging or the cold (in Possum Swamp? ), and, like me, would have loved to have relived those years. When the changes begin to come thick and fast with high school and college graduations, change piles upon change, and some of the things of youth are inevitably forgotten or set aside. I’m proud to say my Pal never was. Oh, even before I was out of high school I had More Better Gooder, but I still found uses for the Pal, once in a while, anyhow. In fact, I didn’t stop using the li’l guy till I left for the USAF. I was surprised to discover, when I returned to the Swamp toting a C8, that one of the acquaintances I found I most wanted to renew was with my Pal. Unfortunately, the intervening decade or so had not been overly kind. In want of space, Mama had exiled him to the carport with its damp and bugs. It looked as if the OM had tried to keep him covered, but the mirror’s coating was in a sad, sad state state. There were patches on the small primary where there was no coating. Maybe a little bit guiltily, he had decided to repaint the now-weathered tube and mount. He didn’t do a bad job on the tube, but the mount was now a weird shade of electric blue that nearly obscured the formerly lovely gray-crackle paint finish. I felt like that space voyager in a Twilight Zone episode who returns home to find that, in accordance with Mr. Einstein’s rules, his best friend has aged to senility while he has remained young. I was a little P.O.ed, wishing the OM had just left my Pal alone, but I had a C8, and there was a lot of other stuff to occupy me—like finding a job. I cleaned up my Pal the best I could and stored him until the time I could give him further attention. Which turned out not to be for nearly eight years. Driven by nostalgia, I guess, one day I pulled out the Pal’s little primary, examined it, and, determining that it was fine except for its abused aluminum, sent it off for a new coating. When it returned, I immediately reinstalled it, and then, finally, my Pal and I were back out under the stars together after nearly 18 years. What did I think? I was impressed by the images almost in spite of myself. They weren’t just as good as I remembered; they were better. Two decades had made me a much more capable deep sky observer, and I was seeing things with the scope I never saw back in The Day. What didn’t impress me? The mount. It was still heavy, every bit as heavy as I remembered, but much shakier than I recalled. And that finder? I’d suffered with that? Which might lead you to believe I soon deposited my Pal back in the U-Storit and moved on. Not hardly. The Pal was to go on to gain at least a small measure of fame late in life. Not long after the scope’s “second first light,” I conceived of a project, a series of columns for my club newsletter demonstratin’ what could be observed from light polluted urban and suburban sites with minimal optical aid, a series I called “From City Lights to Deep Space.” The scope I used for a considerable amount of the observing I did for these columns was, you guessed it, my Pal. I did replace his focuser with a (slightly) better one from Novak and the tiny finder with a Telrad (I carefully preserved both original items), but that was it. I had a ball running the Ms again with my hallowed Palomar Junior, my readers loved the columns, and, eight more years later, the series evolved into an honest-to-god book, my Urban Astronomer’s Guide. If telescopes can feel anything, and I think they sometimes can, muchachos, I believe my Pal is happy in his retirement, basking in a little glory. And I also hope and sometimes believe that somewhere out in the Ether the OM is smilin’ too. Postscript: a few years after the publication of The Urban Astronomer's Guide, I’ve thought about my Pal frequently, but haven't used him much. I hope to change that in 2009, following a complete restoration. My intent is to put the Pal Junior in as close to original condition as I can. To that end, I reckon I’ll have to start haunting Ebay and Craig’s list for a few parts. I suppose I’m lucky in that all I really need is a finder (the old one was missin’ its crosshairs and part of the eyepiece when I returned to Possum Swamp after my Air Force adventures), and one of his focuser knobs (literally fell to dust in my hands one night). I would very much appreciate y’all’s assistance in this project, since, as you can imagine, it’s close to my heart. If you hear about any Pals or Pal parts for sale for reasonable prices (you know how cheap I am), please let your nostalgic ol’ Unk know. Postscript to the postscript: Same as ever' year, the next edition of this here blog will not appear next Sunday, but on Christmas Eve. Y'all be good; the jolly man with the huge belly and the white beard--and I don't mean Bubba down to the club--knows if you have been bad or good! I love the Messiers. No matter how often I go back to M42 or M13 or M17 or any of the rest, I never get tired of ‘em; I almost always see something new. Not that I don’t have my pets amongst the Ms, those objects that, while not necessarily the brightest or the “best,” have special significance for me. I’d like to share some of those with y’all as we wait for the barreling cold fronts of winter to roar through and bring dark (if not steady) skies. First up is the great galaxy M101, The Pinwheel. Yeah, I know she ain’t exactly well placed for observing at the moment, but the Big Bear and M101 will be back in early-mid evening skies before you know it, and this blog entry is designed to both whet your appetite for this spiral monster and to maybe help you develop a strategy for attacking the thing. Most times, you see, M101 is one of the real hard ones as Messiers go. A pest. A hairline reducer. As I found out in short order when I first started running The M List in 1965. Yep, my relationship with this Grand Design spiral goes back to when I was a sprout. You know, knee-high to a grasshopper—or a Palomar Junior. My first glimpse of this one was probably in a little book called Universe from a long-gone publisher called Science Service who pushed kid’s science books from the pages Boy's Life magazine. They were surprisingly good little books, but that is a story for another time. The story for this time is merely the glorious black and white picture of M101 that graced Universe’s pages. The image, likely taken with the 200-inch Hale at Mount Palomar, just turned the 11-year-old Rodster on. Those lovely spiral arms, sweeping on forever; that was what I wanted to see. It’s probably not a stretch to say pictures of face-on galaxies like M101 and M74 are what really got me going in amateur astronomy. Even today I cannot adequately explain the attraction; there was just something about those pinwheeling arms that lit a fire in me. So, naturally, when I finally did get my telescope, M101 was one of the first DSOs I went hunting for after I tracked down M31 (looked much worse in my Tasco than I hoped it would) and M42 (looked much better in my Tasco than I feared it would). Finding 101's approximate spot on the sky was not difficult; it forms a near equilateral triangle with two of the Dipper/Plough’s famous stars, Alcor and Alkaid. This spiral’s specs, which I probably gleaned from Patrick Moore's The Amateur Astronomer didn’t sound that off-putting, either: “M101, NGC 5457, Magnitude 8.3, 28.8’ x 26.9.” That meant this one was, I thought, BIG AND BRIGHT. Yep, soon as The Bear lifted herself away from the horizon I’d be in spiral arm nirvana. Not. If you’re anything other than the rankest novice, you’re probably getting a good chuckle out of this. Yep, Little Rod bravely carried his three-inch Tasco into his suburban backyard, lined it up on the approximate position of the galaxy via the scope’s peep sight, and looked and looked and looked. And saw—absolutely nothing. Not a trace, not a smidge of a spiral arm did I see. In fact, I didn’t see nuttin’ at all. Nary a bit of nebulosity did I discern beyond some faint smudges that I decided were in my mind rather than my eye. Oh, I didn’t give up—for a while. I kept coming back to the area, but with zero results. I eventually did throw in the towel for a while, putting my failure down to my punk little scope or deficiencies in my suburban sky. Which was part of it. 3-inches of aperture is a little small for this beast, and my subdivision sky, though probably better than what most of us suffer through today, was not exactly dark. Those were not the real problems, though. Little Rod’s FAIL came because he didn’t know what he was looking for, nor did he know how to look for it. What should I have been looking for? Seeing as the stated magnitude value for M101 was 8.3, I expected it to be dimmer than M42, sure, but pretty easy nevertheless, and given its size of .5 degree, I shouldn’t have been able to miss it. The problem was I was too dumb to put 2 and 2 together. Take a magnitude of 8.3, spread it out over near half a degree, and that makes the surface brightness of this one about magnitude 15 or worse. The exact same thing as centering a magnitude 8.3 star and defocusing it until it fills the field. Dim. Not impossible, no, but I shoulda been looking for something just barely on the threshold of detection. And you have to know just how to approach such a thang. The secret being "don’t spread out that magnitude 8.3 light so much." I’ve seen this beast easily in 10x50mm binoculars. At 10 power, the light stays tight and close to that 8.3 value. But there’s a gotcha. If you run at very low magnification, any background skyglow is prominent too—it’s not spread out either. This dim ghost of a galaxy is so close to the brightness of the sky from the typical backyard that it melts right into the gray eyepiece field. To fight that you will need dark skies. Get out in the backwoods and the galaxy pops right out. I’ve also found that dry sky is almost as important as dark sky. If there is a lot of moisture in the air, any light pollution will be exaggerated; a small light dome will grow to frightening proportions. Can you conquer The Pinwheel with aperture? Larger aperture usually comes with a smaller field of view. 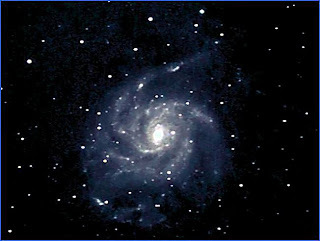 If M101 fills the field, you will not be able to tell where she begins and ends. You need to leave enough sky around the galaxy to provide some contrast. Which is made fairly easy by today’s ultrawidefield eyepieces. You can pour on enough power to spread out the background light pollution enough to make M101 pop out, but still have enough true field of view to provide some dark sky around this devil. When I was writing my urban observing book, The Urban Astronomer’s Guide, I found a 12 – 16mm 82 degree AFOV ocular did the trick with my C11 at f/6.3. I could see M101 almost anytime it was near culmination. By “see,” of course, I don’t mean I could see spiral structure; I just mean I could make out the galaxy’s nucleus and a tetch of haze that represented its outer regions. Getting a look at the arms demands dark skies. Oh, I suppose I oughta mention for those of y’all getting into the astro picture-taking side of amateur life that M101 is trivial to image, even under compromised skies. The above humble snapshot of mine was taken from a site a mere 60-miles or so from the light pollution hell that is Atlanta, Georgia. The nice boys 'n girls of the Flint River Astronomical Society had invited me up to their Georgia Sky View star party, and I’d brought along my Meade DSI CCD camera and CG5-mounted C8 for some casual deep sky snapshooting. While seeing wasn’t great, and the sky was indeed a bit bright, that didn’t stop me from capturing an at least recognizable Pinwheel with 30 or so unguided 30-second exposures. Not bad for a CCD beginner, I reckon, but really more a testament to the ease with which this galaxy can be imaged as opposed to the difficulty of seeing it—at least its details, anyway—visually. I learned to look for and at M101 up in the dark foothills of the Ozark Mountains back in the 1970s. Velvet black skies and relatively dry air meant that M101 fell right in line with the rest of the Ms: “Not challenging, showpieces.” Strange as it may seem, though, my best look at this galaxy did not take place during one of me and my buddies’ storied dark-sky rampages in hillbilly land. It was not, in fact, until twenty years later that I got what I guess is my to-now definitive look at this face-on marvel of an island universe. Mississippi’s Mid South Star Gaze takes place each spring at a site near the wee town of French Camp, Mississippi in the northern part of the state. Back in the mid-90s, before Miss Dorothy and I attained full workaholic-hood, we made the pilgrimage to French Camp a couple of times. We were impressed both with the facilities and with the darkness of the site’s skies. If not always with the weather. Being located just east of Tornado Alley, that part of the state is in the path of some fierce storms in the spring. As we found out. Mid South, which is sponsored by a local (fundamentalist) religious school, French Camp Academy, in those days was run by an extrodinary amateur astronomer and astronomy educator, Jim Hill, and was sited on a hilltop he had turned into an amazing astronomy education facility. 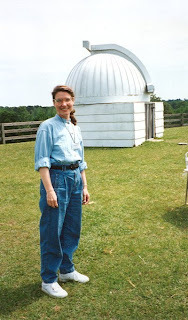 In addition to numerous large and varied telescopes and observatories to house them, this pasture-ringed hill boasted an honest-to-god planetarium dome, lavish warm rooms equipped with Internet connected computers, and more. Things have changed in recent times—read the above linked post if you are interested to know how—but back then MSSG was an excellent event. Miss D. and I were just enjoying the heck out of the site and its marvelous skies one deep spring night. After messing around in Virgo for a while, I decided that with that grumpy ol’ bear at culmination it would be a perfect time to seek out her marvels. M108, The Owl, and, of course, M101. I wasn’t toting a big gun, just my beloved Ultima 8 SCT, so I was not quite sure what I would see. A look through the finder, once I’d moved the C8 to point in M101’s general direction, though, tipped me off that what I was gonna see was gonna be memorable; the galaxy stood out starkly as a round glow in the 9x50. I centered said round glow in the field of one of Celestron’s late, great 26mm “Silver Top” Plössls, and then pulled out my then-current pride and joy, a 12mm TeleVue Nagler Type II. Oh. My. God. The darkness of the site combined with the excellent contrast of the Nagler meant tracing spiral structure was as easy as falling off a log. I kept switching back and forth between the Nag and the Silver Top and honestly couldn’t decide which I liked better. Oh, it was good; the galaxy’s nucleus was tiny and burning bright and, especially with averted vision, the arms just bloomed to life. Then I had a wild idea. I’d just purchased a Lumincon OIII from the star party’s vendor, Rex’s AstroStuff. What might that filter do to the galaxy? Yep, that’s what the man said. “Tornado.” And not “watch,” “warning.” What the—? How could that be? I was peering out 25 million light years into intergalactic space to a galaxy glowing like a danged neon bulb. Then I turned and faced west. Despite the darkness of the skies, I could detect a darker line right along the horizon. I knew from my Arkansas days that that meant bad stuff was on its way. In short order, I and the other folks on the field were not just covering our scopes; we were disassembling them and loading them into our vehicles. By the time Dorothy and I made it back to the relative safety of our bed and breakfast in town, the bottom really did fall out. Not just torrential rain, but high winds (if a tornado didn’t pass through, its sister did) and some of the most intensive and intimidating thunder and lightning I have ever heard. We spent the balance of the evening huddled with our Possum Swamp Astronomical Society buddies (we’d convoyed up), talking over old times and various misadventures while sipping (those brave enough) potations poured out of Unk’s omnipresent bottle of Rebel Yell. It was nice and all to relive the Good Old Days—like the night Bubba set one of his tripod legs in a fire-ant mount and wondered, for a while, why he couldn’t level the dang thing. What I was thinking about mostly, though, was what I had seen. And when we finally called it a night, the persistent vision of that giant night-bird of a galaxy led me into my dreams. Yeah, when I was running through my fave planetariums and planners a couple of blogs back, I knew dadgum good and well that I would, as I warned y’all, leave some out. I still can’t believe what I left out, though: three of the best astronomy apps on the planet. My thanks to the good folks who pointed out my dumb omissions, and my apologies to the creators of these wonderful programs. Is Chris Marriott’s SkyMap Pro (now in Version 11) a planetarium or is it a planner? OK, it’s a planetarium, but one with some fairly robust planning features, at least compared to its brethren. No, it ain’t no SkyTools, but it is still capable of putting together observing lists for you without much fuss. Not only can you tell the program “Gimme all the Ursa Major galaxies brighter than magnitude 11 and put ‘em in the list,” you can click on objects on the program’s virtual sky and, if you want, include ‘em in the list, too. The program even ships with some ready made observing lists for your use—Herschel 400, Messier, etc. SkyMap has a very competent logging system, too, thank you. But there’s no denying the main draw here is the planetarium, and it’s an outstanding one. While it ain’t crazy-heavy on objects (about 200,000 DSOs and 15 million stars), there’s ever’thing here that you or me is likely to wanna take a gander at. And SkyMap presents these objects in the context of beautiful and responsive charts. It does a great job of printing these charts, as well, if you don’t feel like toting a blankety-blank laptop into the field. You do want to carry the laptop out? Since SkyMap now supports ASCOM, it can talk to near-‘bout any telescope under the Sun. What more could you want? You tell me, but chances are SkyMap can do it, since this is just the teeny-tiniest sample of this heavy-weight’s features. The only excuse I can offer for not including Michael Swanson’s NexStar Observer’s List (NSOL) with the other planners is that it’s aimed at a narrower audience than the rest of ‘em, users of Celestron’s NexStar series of go-to scopes. That really ain’t no excuse, though. This planner is more than good enough to make it worthy of a place among its brethren. It ain’t fancy, no; it don’t have umpteen bazillion objects, but it does have what most of us are after, the Messier and the NGC, and a few others things besides like the Abell galaxy clusters. The program’s list generation tools are fairly simple: you open a catalog, sort on various fields, search by names or IDs, and send the objects of your choice to your list. This simplicity does have its strengths. I sometimes forget what the hail I’m supposed to do with SkyTools or AstroPlanner, but I never forget how to work NSOL. What else is NSOL good for? Since this one is designed specifically for Celestron scopes, it offers some features of special interest to the Orange Gang. Like a utility to help you pick the best alignment stars and a simple star chart to help identify ‘em. There’s sufficient data presented for each object, and even a (very) basic star chart to show you where the heck that faint fuzzy is located. The “Hyper Hand Control” is an onscreen “replacement” for the HC that allows NS mavens to easily access, sort, and go-to any of the 47,000 objects in the program’s database. Finally, being specifically developed for use with NexStars, NSOL works very well indeed with that real replacement for the HC, NexRemote. I love NSOL, use it frequently, and can’t believe Mr. Mike still gives it away for free. Thought you knew about all the good freeware planetariums, didja? You don’t. Not if you haven’t tried A. E. Zavalishin’s StarCalc Version 5.72, you don’t. What’s it like? It’s a planetarium with a very clean, well-laid-out user interface, one that reminds me a lot of SkyMap Pro’s sky-window—and that’s a good thing. What else? In addition to being iron-clad solid as far as behavior on my ‘puters, StarCalc offers one very impressive thing: speed. It’s remarkably efficient in its calculations, and is easily capable of slamming a virtual sky onto the display of an older PC in just a couple of seconds. Data? Not bad. It ain’t no Megastar, but it does have the Tycho Star Catalog, a “plugin” that allows the use of the Hubble Guide Star Catalog, and the NGC. I would also guess that StarCalc’s plugin system, which makes it easy to use external catalogs, should mean that there’re plenty of user provided catalogs out there—though I haven’t looked. Finally, the program has a print function that produces very nice-looking hard copy.